Guy Motors Ltd was founded in 1914 by Sydney Guy who had been the Works Manager of nearby Sunbeam. A factory was built on the site at Fallings Park, Wolverhampton. The first product was a 30cwt lorry which employed a much lighter form of pressed steel frame, unlike the more commonly used heavy rolled steel channel frames of the time. 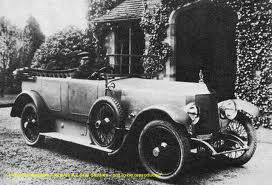 After the war, they decided to make luxury cars with a design by RH Rose, also from Sunbeam. This had Britain's first production V-8 of 4072 cc and featured horizontal side valves. About 25 were made. It was joined by a smaller model in 1922 with the 2465 cc four cylinder 16.9 hp. Both cars were expensive and this limited sales, especially from a relatively unknown company. A cheaper model followed in 1924 with the 1954 cc 13/36 with an engine from Coventry Climax. About 110 of the 4 cylinder models are thought to have been made. In an attempt to enter the car market further, they bought the Star Motor Company in 1928, but it failed to make a profit and was closed in 1932. From the mid 1930s, the company became increasingly involved in the British rearmament programme, developing and producing military vehicles, although by the time of the 1939 - 1945 war itself, Guy was primarily active as a manufacturer of buses.Passenger car sales in the UK virtually ceased during the war, which was accordingly a good time to be a UK bus manufacturer, and more than 2,000 Guy double-decker buses entered service between 1942 and 1945: bus production remained a mainstay of the business in the decades that followed, with a strong emphasis on export sales, major markets including South Africa, Pakistan and the Netherlands. Costly technical research and development undertaken during the early 1940s failed to provide the anticipated pay-back in the years that followed, however. After the war, heavy truck production was revived, but Guy spent the 1950s in a financially delicate state which led to the appointment of a receiver at the end of the decade. Sidney Guy, the firm's founder, had retired in 1957. The business was bought out by Jaguar in 1961. At the time of the Jaguar take-over, the name of the company was changed to "Guy Motors (Europe) Ltd" which may hint at a 1961 management vision of the future: the name reverted to "Guy Motors Ltd" in 1966, however. Guy-badged buses ceased production in 1964: by then the company had developed a completely new range of trucks: the Big J models. The Big J was designed around a new Cummins V6 engine, and was intended for motorway operation. In 1966, Jaguar became part of the British Motor Holdings. In 1968, Guy Motors became part of British Leyland Motor Corporation after the merger of British Motor Holdings and Leyland Motor Corporation. Guy Motors' factory was closed in 1982.